You can see all the different plushies and Petpet clips that are available here. I am not sure if this is possible, but I will ask Mr. Insane (who knows everything about Neoquest I and II). If it is possible, we will make it so. The new issue, (Lost Desert themed) should be on sale around the 11th July. Look out for a Lost Desert Cybunny on the cover. Gelerts will not be the main stars in the next plot, but there is a very cool Gelert who stars in the PS2 game and will feature in the Darkest Faerie plot we will be running on the site. Yes there is. I guess we missed the launch date, but it went on sale in Limited Too around the 12th of March this year. We have, but we have to wait for the powers that be to say it is ok for us to announce it and make it live.. Sorry, as soon as we can let you know, we will. Yes, nasty Mr. Insane forgot to make it live. Make sure you hit him extra hard in Whack-a-staff! It should go up very soon. 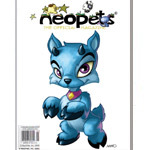 The text that the old owner entered about their Neopet is removed, but the trophies that the Neopet has earned stay with them. Yes, this is something we do want to implement, but it involves changing a lot of things, so will probably take a while to fully test and release. Adam's main is a 60 Night Elf Hunter, he also has a 52 Human Paladin and a 60 Human Rogue. My main is a 60 Human Mage and I also have a 60 Night Elf Rogue. Oops. This was a mistake and should be fixed now. I am sorry, but I really wouldnt have time to do anything on the site if I replied to everyone who responded. Even if your question does not appear in the editorial, it does not mean I have not read it and acted upon it. The editorial is a good place to send any requests for new colours, neohome items, avatars etc. and if you see anything that is not as it should be, just send it my way and I will fix it if I can.